Cosmetic and Beauty industry is one of the fastest growing industries in the world. The demand for different types of cosmetic and beauty products has increased a lot. Today, every person, including the middle class of developing countries is ready to spend a good amount of money in premium cosmetic and beauty products. Consumers have become aware of the good and bad ingredients that are used in cosmetic and beauty products. In order to win the trust of the consumers, companies have started coming up with organic products. It has raised the competition among the companies. If you are planning to have a cosmetic and beauty products business, an eye-catching makeup logo is essential. When it comes to beauty logo or makeup logo you must be thinking of how it can help in the growth of the company. Well, a logo is a graphical representation of a company’s products or services. It briefly explains the story of a brand. The design of a logo is perhaps one of the most important elements in launching a brand. You can create it either in the form image/symbol or text or a combination of both. There are certain elements like color, typeface, images, etc. that makes a makeup logo compelling. For instance, if you choose a red color in fashion and beauty logo, it will represent passion, desire, and determination. Similarly, the choice of an elegant font type signifies high-quality standards of a beauty brand. Being a newbie, coming up with a unique and impressive logo is not as easy as it seems. Therefore, we have come up with great logo ideas. Hope these ideas will inspire you to create eye-catching makeup logo for your own business. Let’s get started! The company wanted to have their hair salon logo in black with white lettering. ‘A hair salon’ being their slogan, they wanted to add it in their logo design.The designer has beautifully fulfilled all the requirements and created not only a fresh and trendy logo but will remain trendy for a long period of time. The brand provides training on permanent makeup techniques to makeup artists in major cities like California, Santa Monica. Since the brand has planned to open their stores, they wanted to have their makeup logo for their new store.The designer has done a great job, and the makeup logo design was picked as the winner. The client clearly specified that they want a pair of scissors to be used in their beauty logo. And you can see what the designer came up with. She has succeeded in conveying the brand message perfectly. The company is into manufacturing and selling sunscreen to different organizations. They were looking to revamp their line and wanted to have a fresh and new logo. The designer has come with the image of sun and a blue line under it to depict sun protection.The brand name along with its slogan has been put just below the image. As you can see, this beauty care logo looks great in their new packaging design. And this is what a client wanted. Looking For A Makeup Logo Design? The client Corinaceren named her business with her name. She wanted to have a logo that looks fresh, timeless and inspired by flowers and by nature. It was also explained that the logo should reflect her name or natural products.The designer carefully followed all the instructions and came up with this unique logo design. She was also picked up as a winner. The Hair Bakery is a manufacturing company that provides healthy hair care alternatives to people with thick hair like African Americans. They wanted their beauty parlor logo with a spoon dripping their company’s name into a bowl.The designer came up with a design that reflects all the specifications given by the client. Simple and catchy – this is what describes this hair salon logo. The designer has chosen the wordmark logotype. Since the brand is into selling top quality hair extensions, at the end of the name the designer has extended the lettering just like a flowing hair. Sharnae Williams was very clear what he wanted to incorporate into his hair salon logo design. The designer has very beautifully fulfilled all his requirements. A heart outlined with different flowers and a keyhole in the middle of it perfectly matches with the nature of the business. And the company name has been written in the cursive style. The design is simply outstanding, as the client thought. What do you think? The creative touch given in this fashion and beauty logo makes the brand stand apart from its competitors. The usage of nail paint in a creative way perfectly describes the nature of the business. ‘Letto Lash’ – creating a fashion and beauty logo for such type of companies is not as easy as it seems. But this is what Designhill is famous for. They get you to get connected with talented professional designers from all around the world. The designer has chosen to have word type logotype for the brand. And this is what he came up with. Among so many entries, he took home the winner award. Modern, sophisticated, and cleverly designed – this is what describes this hair salon logo. The designer has chosen icon-based logotype. He has beautifully created the icon by combining the initials of the brand name. The design is simply outstanding and the designer has taken home the winner award. The brand specializes in selling eyelash serum which helps in increasing the volume of lashes. The client wanted to have a makeup logo that not looks unique and outstanding on their product packaging design. The designer has come up with this beautiful logo. The extension of the word ‘N’ to create the image of eyelashes is what makes this logo stand out. The logo has been designed for handmade natural soaps made with natural products and fragrances. The natural element (leaf) and the golden color used in the logo design makes this logo modern, youthful, luxurious, and elegant. And this is what a client wanted. The requirement of the client was very simple. She wanted to have her beauty logo in the form of signature. The uniqueness of the requirement and the design makes this logo stand apart from its competitors. Just like the name, the designer has chosen the image of a nail in this fashion and beauty logo. The nail has been designed beautifully with a golden color, and the name of the brand has been placed just below it. The logo looks luxurious and modern. What do you think? The client is a professional makeup artist and a blogger who use cruelty free and vegan products. Since cruelty free is related with bunny and other small animals and vegan is associated with plants, so she wanted to incorporate related elements into her makeup logo design. And this is what designer has come up with. Among 200+ entries, Subhan Frendy Pradana took home the winner award. You may find this logo very simple and easy to create. But that’ not true. We received a lot of entries to create this logo, but matching the client’s requirement was not easy. Lio Design was the one who took home the winner award. What a great design- modern, elegant, and feminine! The initials of the brand name have been placed just above the name so that the design looks great marketing materials like brochures, business cards, and even on social media platforms. You can also get creative with your logo design by taking the graphic design services of a professional designer. The requirement made by the client was little technical, and it was not easy to fulfil. All the designers have come up with the best designs, but this design stood as a winner and took home the winner’s award. Since the brand is into both makeup and clothing, the client wanted to have a logo that comes along with an icon that people can relate to. The client wanted ‘BS’ to be used as an icon along with the brand name, suggesting that ‘I’ of ‘Indelible’ should stand out. The designer has beautifully come up with this logo design and took home the winner’s award. The brand specializes in human hair extensions. The client has explained how they have come up with this great brand name. The name ‘Hair majesty’ has been used in comparison to the term ‘Her Majesty’ which is a form of addressing a Queen. Keeping this in mind the designer has come up with a design that reflects power, wealth, royalty and premium quality. The client wanted to have a beauty care logo that not only looks professional but also connect with an upscale clientele. The designer has chosen the initials of a brand and cleverly created the icon for the client. If you want to create an iconic makeup logo for your brand or company, we would suggest you hire a freelance graphic designer. The designing of sensitive stuff should be in the hands of experts only. Bantare Beauty provides 100% organic hair and skin care products that are made from African ingredients. The company wanted to have its beauty care logo unique, eloquent, luxurious, and memorable. The designer has cleverly created the icon by using the initials of the brand. The use of gold color clearly associates the brand with power, wealth, royalty and premium quality. And this is what the client wanted. The client wanted a logo that would be impressive, eye-catching and look professional. This icon-based logo design clearly serves its purpose. The designer has created the image of a woman with a flowing hair inside the circle. The stars around the circle specify that the brand provides complete solutions to get longer and voluminous hair. The brand is into selling soaps, crystal healing jewelry, body butter, etc. Although the brand name itself conveys the nature of the business, still designer has created the design that perfectly matches with the brand personality. The clever usage of the leaf with an image of a happy person makes this logo stand apart from the competitors. The crystals inside the semi-circle are really eye-catching. What do you think? Patricia had clearly defined that she wants the design of her logo to be rustic with a touch of modernity in it. She wanted to portray essential oils as old time medicine that has made a comeback in modern world of beauty and cosmetics. The designer has beautifully fulfilled the entire requirement, and we choose the design as one of the Best 11 at Designhill. The logo has been designed for handmade soaps and other skin care products manufactures. The designer, Nikolina Beader, came up with the design that clearly reflects what the brand is all about. Karabeau is into selling hair oil. Since the oil is of gold color, they need their logo design to match with that color. The designer makes use of the gold as a powerful color to send out the required message to the potential customers. The logo looks great in their packaging design. Isn’t it? The brand is into selling natural skin care products. Just like a name, they wanted to have a dogwood tree in their beauty care logo. The requirement didn’t end here. They also wanted that the design should be flexible enough to get fit to bottles from 2 oz to 8 oz. Atiff Hamadah beat all the entries and took home the winner award. In this case, the requirement of a client was simple. They wanted to have their cosmetic logo design organic, natural, and elegant. The designer has not only fulfilled the requirement but also has come up with a design that will look good on all their marketing materials but in their packing design as well. When it comes to creating a makeup logo it’s all about elegance, eternal youth, eco-friendliness, and natural aromas. It communicates trust in the power of your appearances and feminine charms. Makeup logo can be created in any form – female figures, flowers, whimsical texts, and plant patterns. And the choice of color depends upon the brand’s products. 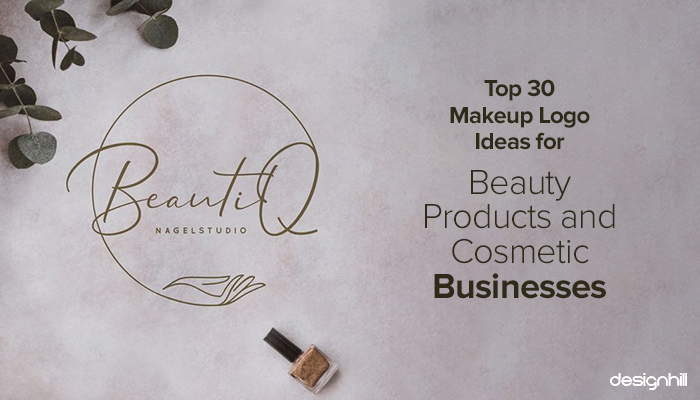 We hope that the above makeup logo ideas will help you in creating one for your business.